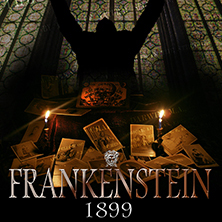 Acclaimed actor Jonathan Goodwin plays Frankenstein, and is joined by actress Amy Bullock, in a show directed by Gary Archer. This event will take place on the Tyne Theatre & Opera House stage with audience seating on stage, therefore seating is unreserved and tickets are limited. Please note that due to the nature of the show we cannot grant access to patrons with mobility issues. No Age Restrictions. Tickets are priced £14, £12 concessions (Plus booking fees when booking online or over the phone) and are available from our afilliate Eventim.